East Village artist and yogi Robin Gaynes-Bachman is shooting off sparks! Not only does she effervesce more than any human has a right to, her artwork literally dazzles, greeting passersby from her studio, Windows on Bond. Painted on large sheets of vinyl with glitter, gold leaf, and other metallic media, or on panels with oils meticulously dabbed with a biology probe, Shiva, Kali, Ganesh, and Buddha add a lively spiritual energy to the street. 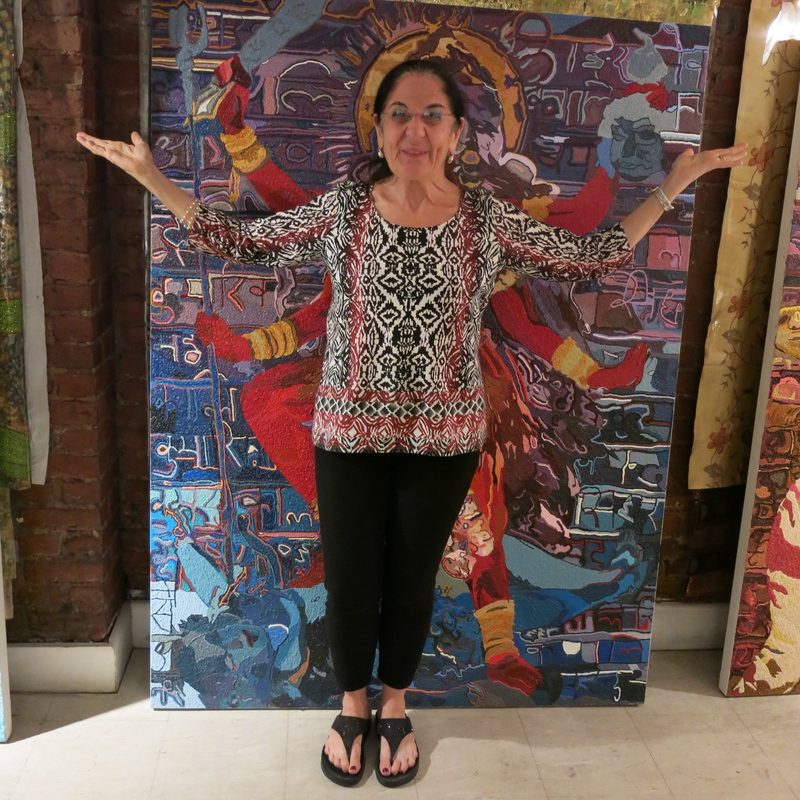 Curious to learn how Robin manages to balance her opulent creative output while adhering to a Siddha yoga path, YogaCity NYC’s Sharon Watts took a private studio tour and had a sit-down with the artist. Q: You are both a born artist and a long-time Siddha yogi. First thing that pops into my head is–you must be Meditation Central! Is there a difference between painting-as-meditation and what we normally think of as meditation? A: They are very, very different and yet very much the same. Years ago I could not meditate to save my life! It was agony; my mind would go wild! I told my guru Baba Muktananda that when I paint, I feel as if I go to the core of Creation itself, and it always felt natural. He said, “Very good.” So I don’t have to meditate also, right? “You have to meditate.” But it was years before I was able to. I was experiencing Tapasia–internal friction, or fire–that is necessary for the inner world to transform into a whole. Q: What is the Siddha Path and what got you on it? A: I was never overtly looking for a path, but I grew up with a lot of yelling; I was very angry. In 1976, my sister urged me to come to the ashram in upstate New York. Weekend after weekend I’d go, but when they said “You’re here to see Baba” I insisted, “No, I’m here to see my sister.” I mean, what was a nice Jewish girl doing with an Indian guru? I finally realized something was shifting in me, but it had nothing to do with Baba, although his strong, meditative presence put me in my own state of extraordinary joy. I stayed on this path because I felt transformation every day. I knew that this state of joy was available, and I wanted to be there all the time. Basically, it is being at one within your own self. Q: Tell me more about your Deity series. How do you choose which deity to paint? A: I think they choose me! Initially my friend urged me to start, in 2001, and I began with Shiva. While reading the Bhagavad Gita, I knew I then had to paint Krishna, and over the course of sixteen months of simultaneously reading, painting, and chanting, I became hooked. Next came Saraswati, then Kali, Durga, and Hanuman, the Monkey God. Each oil painting reflects what I need to learn, when I am ready to learn it. It becomes apparent to me that the deities’ qualities are those I need to contemplate and imbibe. Q: How much has your yoga informed your creative process? A: For many years, my main practice was chanting the mantras while painting. I could actually feel them purifying my mind, and the discipline allowed me to work through whatever feelings or thoughts I was experiencing, releasing a deep sense of freedom I could express in the work. I realized that a deep joy existed underneath all the transient feelings. I remember one Thanksgiving painting, crying, being so sad I was all alone, yet this area of the painting is the most joyous! Underneath all the feelings was a pulsating bliss, a union with the core of my own being. Q: Confronting a blank canvas, what happens? A: Chanting sacred mantras, contemplating the scripture, working on the painting–a kind of intuitive alchemy happens. Colors jump into my hand! Whatever mantra I need to hear appears. Even if I am not thinking about what every part of the scripture means, I incorporate the Sanskrit into the painting, using their shapes. The contemplation is so deep; once I get into it I don’t remember how to speak English! Q: The vinyl art with metallic paint and glitter is very different from the oils–how did they evolve? A: I decided to do deities in every spiritual tradition, not just mine, because I believe in every tradition. Because my studies of Hinduism are so deep and exciting to me, and my knowledge and willingness to study Buddhism just is not–I couldn’t spend a year an a half on an oil painting, but I could spend a month or two–that’s how I started the vinyl deities. Q: Glitter is an interesting choice. While it might symbolize surface glitz and no spiritual depth to some, I think you might have a different take on it. A: When I was a young girl growing up in Manhattan Beach, I was always fascinated by the boulders that sparkled with mica, and I wanted to somehow reproduce the magic they represented to me. Over the years I’ve come to recognize my own inner self, and that my use of glitter reflects the divine inner light. We are all made of light. Q: Having the deities in your rotating gallery Windows on Bond must give people pause. What kind of feedback do you get? A: I moved here in the early ’90s, when there was a rougher street vibe. Even though that has dissipated, my neighbors thanked me for putting the deities in the windows, telling me “We feel protected.” Once I saw a man in a suit stop and place his palms on the window, chanting Om. This went on for quite a while. Then he picked up his briefcase and walked on. Robin has created her own personal yellow brick road, illuminated by her spiritual joy and a sprinkling of glitter, and welcoming to all.